Description This Dublin, Georgia bed and breakfast has free internet access and non-smoking guest rooms. Rooms decorated with antiques and featuring modern amenities like cable TVs and Wi-Fi complement the free hot breakfast at the Page House Bed and Breakfast. 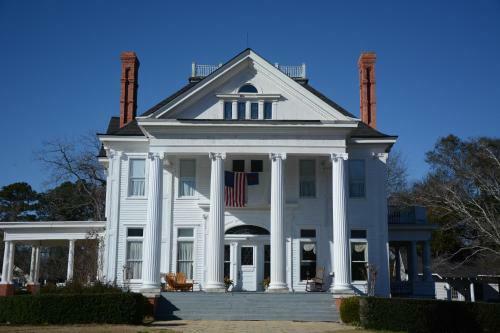 This white-columned antebellum-style bed-and-breakfast was built in 1903 and has six themed antique-adorned rooms with cable TVs and Wi-Fi; depending on the room other amenities include microwaves and refrigerators fireplaces jetted tubs and a balcony. Guests enjoy a free hot breakfast featuring items such as French toast or sausage and egg casserole. There's an outdoor picnic area with barbeque grills where guests can cook out. Parking is free. The hotel is located within four blocks of Dublin's historic district and antique and gift shops. Dublin a sister city to Dublin Ireland is about halfway between Atlanta and Savannah. Middle Georgia College's Dublin campus is a mile-and-a-half away. Racing events are about 30 minutes away at Cochran Motor Speedway. Savannah/Hilton Head International Airport is around 110 miles away. Add Page House Bed & Breakfast to your free online travel itinerary.